Place the Whipping Cream and Pistachio Pudding Mix in the bowl of an electric mixer or food processor fitted with the metal chopping blade. If using an electric mixer, fit it with the wire whisk attachment and run at high speed until the Cream/Pudding mixture has formed stiff peaks. Press out as much of the liquid from the Pineapple as possible and fold into the Pudding Mixture. Fold in the Marshmallows; if the mixture seems too stiff, you can fold in a little of the reserved Pineapple Juice. Transfer to a serving bowl or individual dishes. Refrigerate one hour before serving. 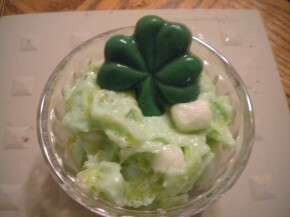 When ready to serve, top with additional Whipped Cream, if desired and the Shamrock Candies.